Hello! 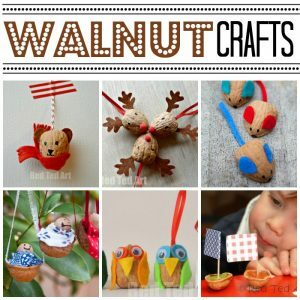 Today we share out little Walnut Babies (aka Walnuss Wiegenkinder or Walnussbaby), yet another classic German/ Austrian childhood craft. We love Walnut DIYs. 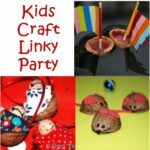 This is also very special edition of “Kids Get Crafty”, as it is part of the Kids Craft Group “Advent Calendar Activities”. 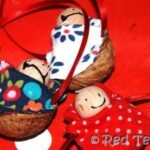 A number of blogger friends have got together to create an activity a day for you to have fun during the advent period. 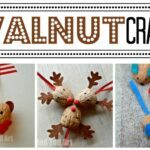 Today I am sharing our little Walnut Babies – so dig in to those seasonal nuts and get crafty! 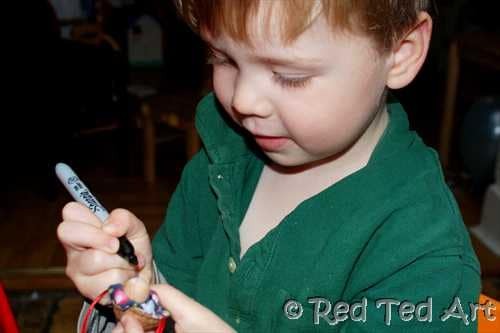 Note: Red Ted is almost 4yrs old and I found that he “loved the process”, but did need help. I think replacing our fabric with felt would have made it easier for him. 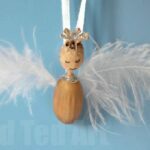 If you don’t have a wooden bead to hand (which wouldn’t surprise me!!) 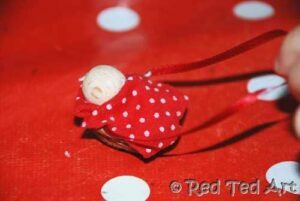 you can adapt this craft by making the head as per the angel craft from an old pair of stockings. Just tie the pipe cleaner “into the head” as you make it. 1. First you need to split the walnut carefully and try and get two intact pieces. 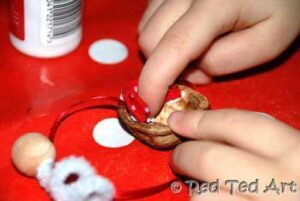 The best way of doing this, is to get a kitchen knife or a screw driver and insert it into any weak spot you can find on the nut. Then on a chopping board, give it repeat taps until it hopefully comes apart. Mine all came apart easily, but needless to say: take care… and if in doubt move onto the next walnut! 3. Glue the bead onto the pipecleaner. Wrap the pipe cleaner round your finger. This will give the baby a “body” and prop the bead up (i.e. this is the clever bit I got from Zeit Online). 6. Draw on eyes and mouth. Now out felt tip did run a little, so you may want to paint these on or varnish your bead first. Red Ted did an AMAZINg “1st face” – just perfect… and went a little vampire like on the 2nd two. But look at his little face, he was SO excited to be doing it. And at bedtime, when his father asked what we did that day, that was all he would talk about! Hang in your tree and admire. 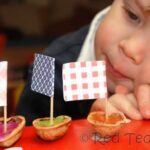 Walnut Mouse Racing or some Walnut Boats? 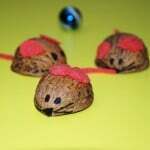 Very cute, I need to track down some walnuts. Or go buy some at the store. 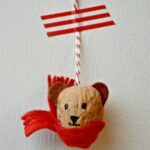 Very cute – think I may have to go and have a go at this myself. Lovely Maggy! How sweet to have a little family if them hanging from the Christmas tree. Thanks Cathy! Our main “problem”, is that Pip Squeak as taken a shine to them and carries them around with her…. no going on the tree (for now!)…. These are SO adorable!! I think I need to find me some walnuts! Those are so cute. I think he did a lot of the work. This would be perfect for my daughter who is 7. Off to share this wonderful idea. 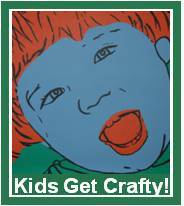 And Art For Little Hands – yes, he helped every step of the way and a 7yrs old should be able to manage perfectly!! These are the sweetest little babies I’ve ever seen! This would be the perfect ornament for baby’s 1st Christmas! Adorable! love them! now we have to buy whole walnuts! So cute! 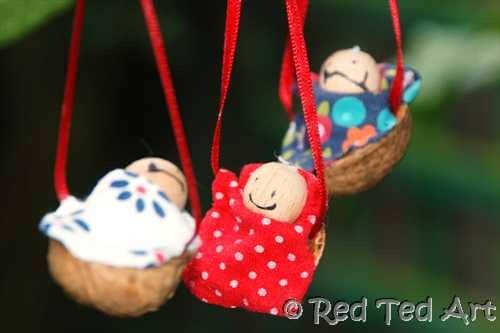 My mum still has the walnut babies on her tree each year that she bought at our primary school fair (all mum-made crafts) when I was not much older than Red Ted! You are such a crafty mum! 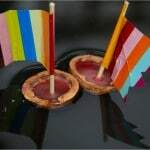 Those are very sweet! He did a great job! Oh I wish I had some walnuts. I want to make some myself… and I am sure my daughter would too. Very, very sweet! 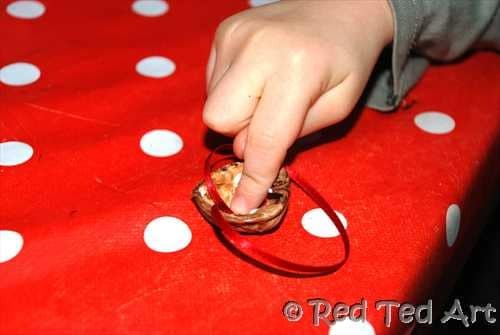 Do you have any ideas what could be used in place of the shell for those with nut allergies? Ah no, poor you/ child. I was going to do a peanut craft soon and thought about allergies on that one.. but “forgot” the general nut allergy children 🙁 sorry!! Or any toy that comes in a ball that you can split in half? You could maybe use part of an egg carton (the dip) or half of a chestnut shell (the spikey outer bit). Or you could cut the “bottom” off a small bottle (like a travel shampoo bottle). So cute! 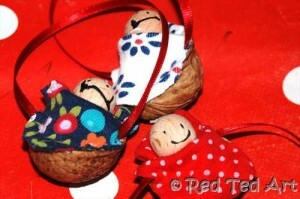 They remind me of all the decorations that my grandmother used to maker using walnut shells! So lovely! Thank you for posting these! These are soooo cute. We bought mixed nuts in the shell yesterday. 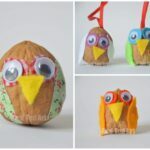 I’m not the craftiest mom, but I will be making these as soon as I get the supplies from the craft store. I like that there will be no glitter. That has been the craft item of choice for my eight year old daughter lately. 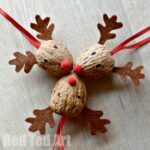 I’m so looking forward to making these and hanging them on the tree. Thanks for the idea! I’m sharing this post on twitter and adding it to pinterest, so I make sure I do it this busy holiday season! HOORAY! Thank you 🙂 And I rather like things that do NOT involve glitter as well…. This is adorable. I have never had much luck splitting walnut shells but those babies sure are cute! oooh my girls would love these! How cute! I’ve never seen these before, but I love them! We’re expecting a baby in January, and my kids will surely enjoy making these! Bern – I confess to having had problems cracking the latest batch of walnuts!!! How odd.. the first batch ALL opened! The 2nd batch I get about half! Good luck! Bri & Julia – have fun and Julia good luck with the new baby! Hope it all goes smoothly and easily! Oh no, that really IS a shame! I can only think of “lid tops”, but I am not sure if they would have the right dimensions. OR…. could you make some air drying clay beds ahead of time for them?